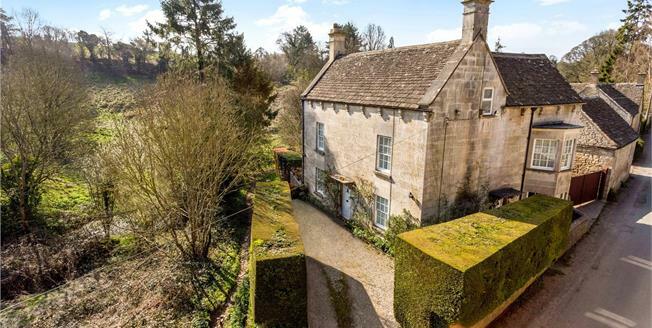 A handsome Grade II listed detached country residence located on the edge of a traditional Cotswold hamlet surrounded on two sides by open countryside. It is believed that it was once two houses, number 10 & 12. This stone built property is tucked discreetly behind its mature hedges & Cotswold stone walls and benefits from two drives; one drive to the front & a second gated drive to the rear. A period stone outbuilding utilised as a garage is also located in the gated courtyard behind. Agent note: The property is pending title registeration. Nags Head is a pretty Cotswold hamlet located between the villages of Minchinhampton, Avening & Cherington. It's in a designated Area of Outstanding Natural Beauty. The nearby village of Avening provides two local inns, a Norman Church and a primary school. Nailsworth, Cirencester, Tetbury and Stroud offer more comprehensive facilities and services. Kemble station, only 8.8 miles away, offers Intercity train services to London (Paddington). Minchinhampton Golf Club boasts two courses nearby. The pretty mature rear garden backs & sides onto open countryside. The pleasant aspect is enjoyed from the patio and two levels of lawn. There are a variety of trees, shrubs & hedging. A pedestrian access leads onto the public footpath, perfect for dog walkers. A gated courtyard houses a two storey detached garage (with expired planning to convert into a one bedroom flat) plus private parking for one car. Oil tank found near pedestrian access onto the public path.